Very specialized fitting. GLUES on to 1/2 braided hose and provides a female garden hose end. See M-64 on the male garden hose fitting page for the male part to complete the hose. 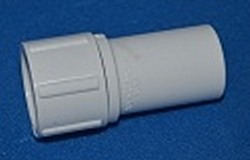 Will glue on to most hoses that are 5/8" OD and made of PVC or Vinyl. 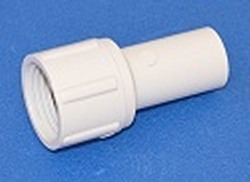 3/4" Female Garden Hose (swivel) by 1/2" Slip Socket. Also 3/4" FGH by 3/4" Spigot. Similar to 535-005.